"When I was a little girl, my mother would always make us crepes on Sundays. I also loved the smell of vanilla when my mother would make her cookies. So, I would always ask her to make her cookies, and when she refused, I would take out the vanilla and sit it next to me with the cap open, so that I could breathe the aroma. My mother get a kick out of this, and said, well, if it's that important, we'll add a little vanilla kick, just for you. After the first time she put the vanilla in, there was never a last...it became a tradition." 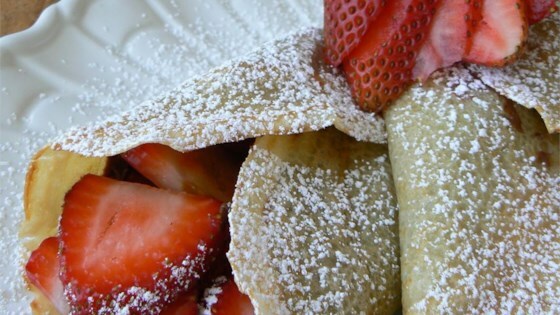 A little extra vanilla in the batter makes these crepes irresistible. REALLY good. That is a direct quote from my kids. My 2 cents-- I threw all my ingredients into the blender and poured from there... much easier.